So this year, Easter falls on the 1 April. 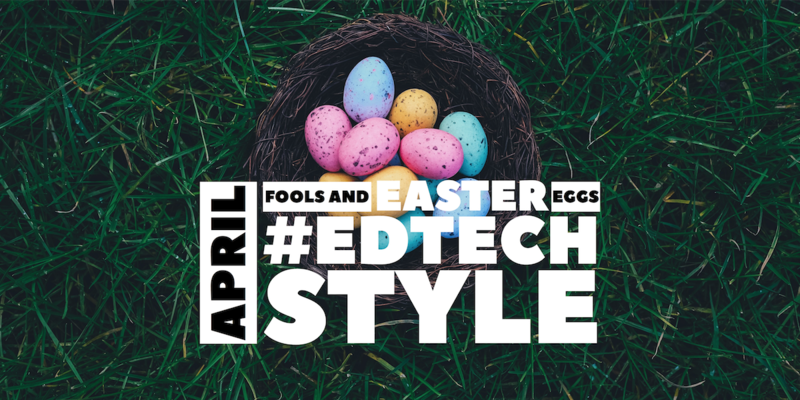 This doesn’t happen very often, but some things that do happen each year with annual regularity are the Easter Eggs and April fools tricks that lots of different #edtech companies put out there. Well, of course, it’s all a good bit of fun and all of that but how could this sort of thing be used in Education? Well… in this world of fake news, how our data is used by companies such as Cambridge Analytica – it is incumbent upon us as educators to ensure learners are savvy to how their footprint and usage of online tools can be used by others. Easter eggs and ‘fun’ scams such as these by Google for April Fools are a great way to use safe examples to help young people see how easy it is to hoodwink others; especially if you have a bit of budget and some video editing skills! You can find a bunch more of the Google examples on this post from The Verge. With this and the things that other tech companies get up to with things like Snapchat’s Easter Egg Hunt taking place this year in the mapping tools in their app, I’m looking forward to the fun surprises that are going to hit us over the next 24 hours. What’s your favourite?